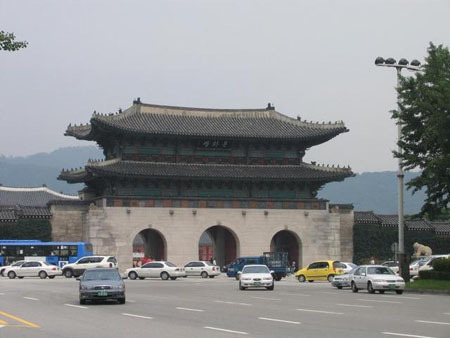 Today the Cultural Heritage Administation announced that the Gwanghwamun Gate (the main entrance to Kyongbok Palace) will be dismantled and reconstructed to its original Joseon Kingdom form. It will be a huge change since they will reconstruct the new gate at its original place which is different from the present place. A big plan which will definately give the city another look. Time to take pictures, I guess. 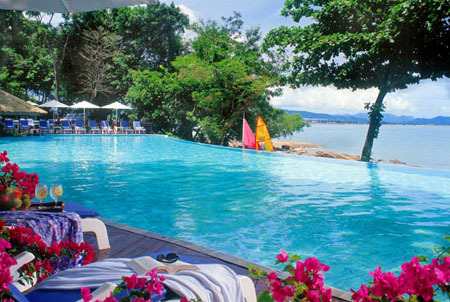 Imagine us swimming in this pool, yeah!! 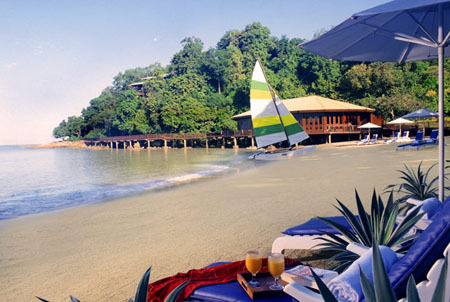 A cool Tiger beer on this beach, wow, I am looking forward to it..
Just now I read an article about Korean women which says: Majority of married women say: doesn't need to have a child. (for reading click on the news button on the Arirang-site) It catched my eye because this morning I also read an article in Dutch about the same topic. Although the Dutch women are not always married, the message is the same. It's hard to combine work with a child or with a carreer and also the other side of the story: it's not good for the future of our society not to have children. From eye-sight to cell phone. Until I read this article I really never wondered about all those opticians you see on the streets of Seoul. I thought it had something to do with fashion since so many people were wearing glasses in different colours, sizes and shapes. But no, it has nothing to do with fashion, according to the article Korean students have more eye problems than their New Zealand counterparts. All kinds of reasons are given including watching tv and spending time behind the computer, but also the lack of spending time outdoors. How on earth can you compare South Korea (Seoul) and New Zealand in this case? First of all, most Korean students do not have time to spend outdoors (all the after school activities/classes and returning home late) and second: Is it really healthy for the eyes to be outside on the streets in Seoul? Nowadays, a century after Dr. Bates activity, human life is even more stressful than before. In addition to that aspect, already so harmful, we have some others, which play significant roles in the state of our eyesight. Dead, unbalanced & toxic food, polluted air & water, toxic cosmetics & cleaning products, huge consumption of all kinds of chemical drugs (vaccinations, antibiotics, pain killers, sleeping pills, anti-depressants and so on, and so on), often hastily prescribed & too strong corrective lenses, exposure to EMF radiation (electromagnetic field radiation) by excessive use of cell phones, computers & TV. Today I read in a Dutch magazine (Elsevier Thema January 2006) a top 10 of the best airports in the world 2005. Research has been done by Skytrax and you can vote now online for your best airline and airport of the year 2006. The reason why I mention this is because Seoul Incheon Airport has been awarded as the number 3 best airport worldwide 2005. Something to be very proud of, I guess.